Bloodborne is an entirely different matter. The new Regain System completely changes the logic on offensive vs. defensive play. If you take a hit in Dark Souls, you need to use a healing item to replenish that lost health. 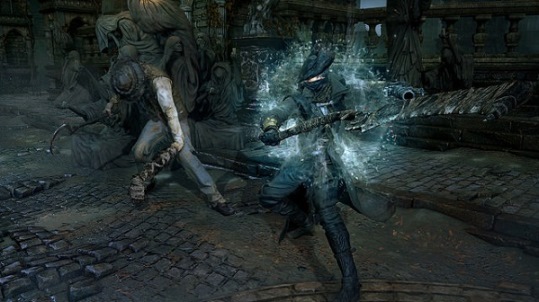 However, the Regain System in Bloodborne allows players to regain lost health by performing a spot-on counterattack. The more precise you are with counterattacking, the easier it will be to regain that lost health. However, if you’re not precise and attempt to wildly counterattack with no rhyme or reason, you won’t regain your lost health and will instead take additional hits during fast-paced battles. It looks like From Software is leading harder than ever before into the horror genre with Bloodborne. The ancient city is filled with horror looking zombies, werewolves and other creepy creatures which will probably make it way scarier than the other games of this genre and we are pretty sure that punishing gameplay of BloodBorne is going to put the survival back into survival horror.